I was a Doctor Who fan before I realized it. When I was in elementary school, a friend had some episodes on VHS recorded off of TV. He insisted that we sit down and watch while I was over one afternoon, and I recall that we watched them several more times after that. The particular series focused on Meglos, an evil shape-shifting alien cactus who wanted to steal a powerful object called The Dodecahedron. There were also space pirates, who became lost in the TARDIS and I think were mostly there for comic relief. At this point, Tom Baker was playing The Doctor, his signature scarf always draped around his neck. I was taken in by all of it: the blue box that was bigger on the inside, the strangeness of the bad guy, the flights through both time and space, the cool theme song. And eventually, I'd find, a hero who regenerates when he dies. My friend had just enough episodes of this show for me to realize that eventually the Doctor changes. The show keeps going, just with a different actor playing the title character. I wasn't sure about this part at first, because I'd already taken to Baker and didn't know if I'd like the next person. 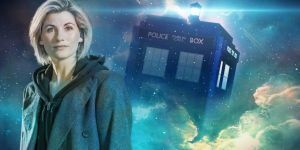 At my young age, I had become privy to one of the most common issues that Doctor Who fans face: uncertainty that they'll like the new actor around whom their beloved franchise will rotate. When the series was revived in 2005, I didn't immediately start watching. In fact, I didn't catch up with the show until Matt Smith had taken over, two Doctors later. But when my wife and I finally did begin with Christopher Eccleston's turn, I wasn't sure. This guy in a black leather jacket didn't bear much of a resemblance to Baker's long scarlet coat and colorful scarf. But eventually, I accepted him on his own terms and could appreciate what he brought to the role. We'd do it again with his three successors, making adjustments and recognizing the different personality quirks brought out by each. Let's just say that the reaction to this has been mixed. Jodie Whittaker is the first woman to play the role in the show's 50+ year history. With such a long backlog of episodes, actors, and experiences behind us, this change has been seen as quite radical for a certain portion of the fanbase. I'm developing a theory as to why something like this gets such a strong reaction, the same as when they made a Ghostbusters movie with an all-female cast, when Hermione was cast as a black woman in a Harry Potter play, and when other franchises have made changes that go in a bold new direction. I mean besides misogyny and racism. Let's just go ahead and name those things because they definitely play a part in all this. Think about how you reacted when your favorite band decided to try a new sound on their latest album. Or when, after a few years, your beloved show kills off a certain character. Or when your favorite comic book starts a strange new arc that doesn't seem at first to gel with what came before. What happens is similar to how Whittaker has been received. It's not like what I grew up with. It's not like what I've come to know and expect and treasure from this artist/show/movie/whatever. Our earliest experiences with something tend to become the ones we love the most and, in many cases, the ones we insist they maintain. Never mind that later changes may become access points for others to fall in love with it, too. Because after all, we loved it first when it was this other way, and new developments are a cheapening/broadening/destroying of the more authentic thing that I prefer. Objectively, it might not really be worse, but from the perspective of my memories formed during particular life stages, it's horrible. When you connect with something at a certain point in its creative life, it doesn't seem to take very long for that connection to solidify and become what you believe it should always be. I for one am excited about the show's new direction. We've come a long way since Tom Baker battled a cactus, but I'm able to hold those loosely enough to love what's come after.